The annual candlelight vigil is a hallmark event for Elvis Week. This year's event was controversial because, for the first time, visitors attending had to pay $28.75 for a wristband to walk up the long driveway and past the graves where Presley and relatives are buried. The wristband also provided access to a new $45 million entertainment complex at the Memphis tourist attraction. Presley died on Aug. 16, 1977, at 42. He was found dead in his bathroom in the Graceland mansion in Memphis. Though he was rushed to Baptist Memorial Hospital, attempts to revive him were unsuccessful. He was initially believed to have died from heart failure, but further investigation revealed that abusing prescription drugs may have contributed to his death. I have always been a fan of Elvis. It's hard to believe it's been 40 years since he passed away. Re: The 40th anniversary of Elvis Presley's death. My dad was a huge Elvis fan, and he made me cassette tapes of Elvis which I listened to when I was around 8 to 10 years old, so it was a big deal when Elvis died. I also enjoyed most of the movies he starred in, namely the late 50s, early 60s output. I'm surprised how few Elvis movies have made it out on Blu-Ray. I see Twilight Time and Kino putting out a few movies, but still not sure about the Paramount movies like Blue Hawaii and G.I. Blues. I guess if the 40th anniversary of his death won't get those movies released onto a current format, then nothing will. Fake news. 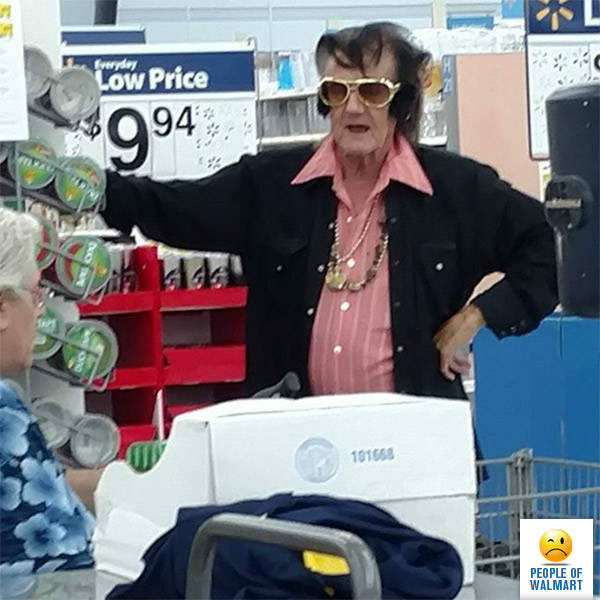 Elvis is alive and well shopping at Walmart.